Place the toppings in separate deep dishes, set aside. Line a tray with baking paper. Wash the apples in hot water and wipe them dry so that the toffee will stick to the fruit. Place the sugar, water and lemon juice in a pan and bring to the boil, simmer over a medium heat for 5-10 min. until the sugar has dissolved. Check the temperature of the sugar mixture using a thermometer. It should be 145-150 °C, or heat the mixture until it caramelizes. To test for the right consistency, take a spoonful of the toffee and place in a bowl of cold water. It should harden immediately and, when removed from the water, should be brittle and no longer malleable. Once the correct temperature has been reached, remove the pan from the heat. 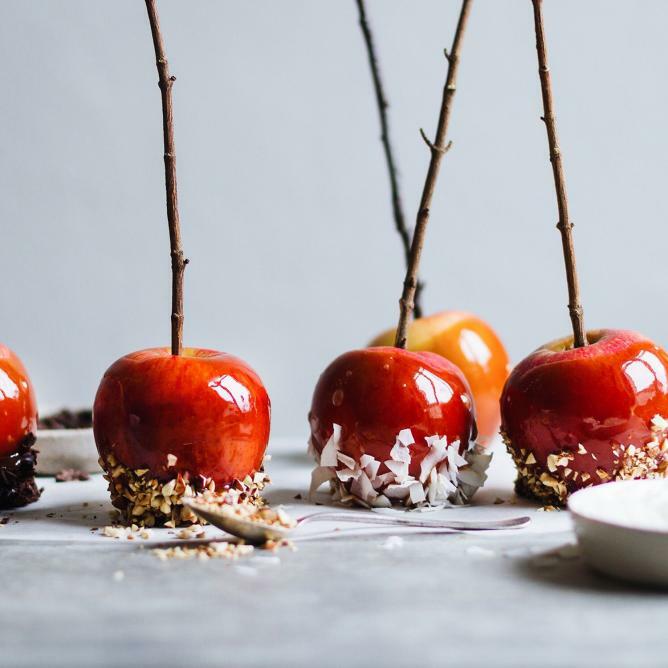 Push the wooden skewers or twigs into the apples. Carefully but quickly, dip the apples one by one into the hot toffee, turning them to coat them completely in sugar. Allow any drips to fall and then place on the baking paper, leave to dry a little. While the toffee is still a bit soft, dip the lower half of the apples into the toppings. Allow to cool completely before eating. The apples will keep for up to two days if stored in a dry place.